Since nearly everyone else seems to be employing "Star Wars" metaphors these days, permit me to use some of my own. To conservatives, the Republican congressional majority was supposed to be the good side of "The Force," as opposed to what they regard as the Democratic "dark side." And yet, unlike the film, "dark side" Democrats have triumphed again in the latest budget battle, which was no battle at all. The supposed good guys surrendered without a fight against the relentless onslaught of the Democrat "stormtroopers" and their media enablers. 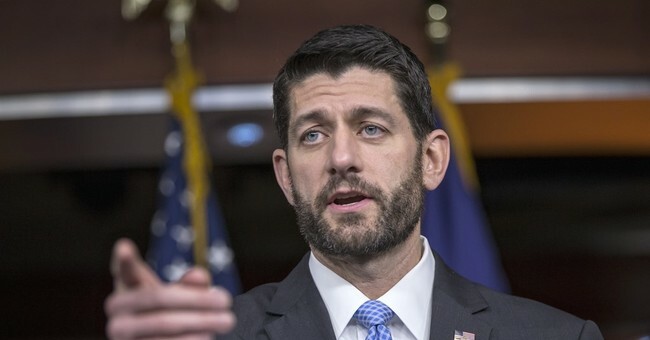 The monstrous $1.1 trillion omnibus spending bill passed by the Republican majority House and Senate was praised by President Obama, who called House Speaker Paul Ryan to congratulate him for making government "work." It's working for Democrats, but not for Republicans, or the country, as the national debt marches toward $20 trillion. Republicans have their biggest congressional majority since the Civil War, but behave as if they are powerless. They live in fear of a government "shutdown" for which they believe they will be blamed by the media and by voters. Is it any wonder Donald Trump is the leading Republican presidential candidate? This bill represents not only what people hate about Washington; it's what they hate about the misnamed Republican "leadership." Voices on the right, from Rush Limbaugh, to Sen. Jeff Sessions (R-AL), are calling the spending bill a "betrayal." Voters in two previous elections put Republicans in power and increased their margins for the express purpose of reversing, or at least halting, the unpopular policies of President Obama. A Democrat majority could not have done better. Senate Minority Leader Harry Reid (D-NV) almost developed a personality in his response to the Republican capitulation. Reid said Senate Democrats had three goals: "We wanted to get rid of sequestration, we were able to do that. We wanted to make sure there is parity between defense and the middle class, we wanted to make sure that we kept these poison pills off the legislation. All three goals we had, we accomplished." Reid also bragged about beating back GOP efforts, later abandoned, to defund Planned Parenthood and to tighten rules for accepting refugees, or as Democrats believe, future Democratic voters. A giddy Sen. Charles Schumer (D-NY) said: "If you would have told me this year that we'd be standing here celebrating the passage of an omnibus bill with no poison pill riders at higher (spending) levels above sequester than even the president requested, I wouldn't have believed it. But here we are. This bill is a great victory for the principles Democrats stand for." Demonstrating again how out of touch he is with voter sentiment, Senate Majority Leader Mitch McConnell spoke in a radio address about process, not substance: "We got committees working again, just like we promised. We opened up the legislative process, just like we promised." Who cares about that when Republicans are losing the policy debate to the minority? Republicans failed to keep far more significant promises, like defunding Obamacare and rolling back the president's agenda. On his radio program last Thursday, Rush Limbaugh said, "There is no Republican Party. You know, we don't even need a Republican Party if they're gonna do this ... just elect Democrats, disband the Republican Party and let the Democrats run it, because that's what is happening anyway." Maybe it's time the "Grand Old Party" was retired and replaced by a grand NEW party. This GOP is rapidly going the way of the 19th-century Whig Party, which the Republicans replaced in time for the election of Abraham Lincoln. "The Force" is no longer with today's Republicans, who have given in to the Democrats' dark side.